विलियम होगार्थ (November 10, 1697 – October 26,1764) was a major English painter, printmaker, pictorial satirist, social critic and editorial cartoonist who has been credited with pioneering western sequential art. His work ranged from excellent realistic portraiture to comic strip-like series of pictures called “modern moral subjects”. Much of his work, though at times vicious, poked fun at contemporary politics and customs. Illustrations in such style are often referred to as Hogarthian. The son of a poor school teacher and textbook writer, William Hogarth was born at Bartholomew Close in London on November 10, 1697. In his youth he was apprenticed to the engraver Ellis Gamble in Leicester Fields, where he learned to engrave trade cards and similar products. Young William also took a lively interest in the street life of the metropolis and the London fairs, and amused himself by sketching the characters he saw. Around the same time, his father, who had opened an unsuccessful Latin-speaking coffee house at St John's Gate, was imprisoned for debt in Fleet Prison for five years. Hogarth never talked about the fact. By April 1720 he was an engraver in his own right, at first engraving coats of arms, shop bills, and designing plates for booksellers. In 1727, he was hired by Joshua Morris, a tapestry worker, to prepare a design for the Element of Earth. Morris, however, heard that he was "an engraver, and no painter", and consequently declined the work when completed. 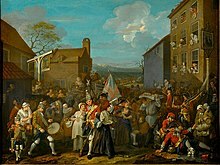 Hogarth accordingly sued him for the money in the Westminster Court, where the case was decided in his favour on May 28, 1728. On March 23, 1729 he was married to Jane Thornhill, daughter of artist Sir James Thornhill. In 1757 he was appointed Serjeant Painter to the King. 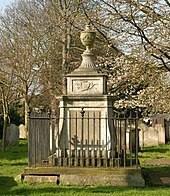 Hogarth died in London on October 26, 1764 and was buried at St. Nicholas's Churchyard, Chiswick Mall, Chiswick, London. His friend the actor David Garrick wrote the inscription on his tombstone. Other early works include The Lottery (1724); The Mystery of Masonry brought to Light by the Gormogons (1724); A Just View of the British Stage (1724); some book illustrations; and the small print, Masquerades and Operas (1724). The latter is a satire on contemporary follies, such as the masquerades of the Swiss impresario John James Heidegger, the popular Italian opera singers, John Rich's pantomimes at Lincoln's Inn Fields, and last not least, the exaggerated popularity of Lord Burlington's protégé, the architect and painter William Kent. He continued that theme in 1727, with the Large Masquerade Ticket. In 1726 Hogarth prepared twelve large engravings for Samuel Butler's Hudibras. These he himself valued highly, and are among his best book illustrations. Back home, he immediately executed a painting of the subject in which he unkindly represented his enemies, the Frenchmen, as cringing, emaciated and superstitious people, while an enormous sirloin of beef arrives, destined for the English inn as a symbol of British prosperity and superiority. He claimed to have painted himself into the picture in the corner, with the solder running him in. 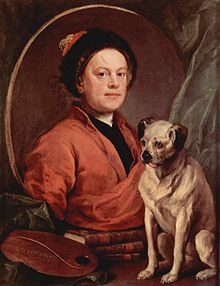 In 1745 Hogarth painted a self-portrait with his pug dog (now also in Tate Britain), which shows him as a learned artist supported by volumes of Shakespeare, Milton and Swift. In 1749, he represented the somewhat disorderly English troops on their March of the Guards to Finchley (formerly Thomas Coram Foundation for Children, now Foundling Museum). Hogarth's paintings and prints have provided the subject matter for several other works. For example, Igor Stravinsky's opera The Rake's Progress, with libretto by W. H. Auden, was inspired by Hogarth's series of paintings of that title. Russell Banks's short story, "Indisposed," is a fictional account of Hogarth's infidelity as told from the viewpoint of his long-suffering wife, Jane. Hogarth's House in Chiswick, West London, is now a museum (free entry); it abuts one of London's best known road junctions – the Hogarth Roundabout. ↑ Hignett, Tim (1991). Milnrow & Newhey: A Lancashire Legacy. Littleborough: George Kelsall Publishing. A late painting by Hogarth entitled Hogarth's Servants, mid-1750s. This page was last edited on २८ अगस्ट २०१४, at ०५:१८.